Another steller morning playing racquetball. I can definitely feel myself getting better. My patience with the game (knowing when to be aggressive and when to dial back and just volley) is greater. One thing I do know – killshots are satisfying, but not as much fun as a nice rally. What else am I up to today? Well, I spent about 45 minutes using tweezers pulling bits of grass and brush out of my favorite green wool sweater. I made the mistake of wearing it when we went out to the Laguna Mountains to watch the meteor showers a few weeks ago. I got quite a bit of the woods caught in the wool and there was no simple way to get it out. I tried Jenny’s lintroller and that brush just laughed at me. Thus, the tweezers. I can’t think of a single thing you have to use tweezers for that is a good thing. I remember when I used to work in the ER little kids would sometimes get cockroaches caught in their ear and they had to go in there and get it out, which is a tricky operation, because when you have a damn cockroach in your ear, you sure as heck don’t want to stay still. What was I talking about? Oh yes, some things are difficult work, and can only be done with patience and special tools. # 2001 December Zero comments Laguna Mountains . words for the day: shenanigans, folderal, hijinks. # 2001 December Zero comments No hashtags. Jennifer is justifiably terrified of Robo Baby. Robo Baby is the interactive baby that will crawl her way into your heart. Robo Baby is made by Tiger Toys which is owned by Hasbro. # 2001 December Zero comments Hasbro . The information revolution is altering the nature of conflict across the spectrum. We call attention to two developments in particular. First, this revolution is favoring and strengthening network forms of organization, often giving them an advantage over hierarchical forms. The rise of networks means that power is migrating to nonstate actors, because they are able to organize into sprawling multiorganizational networks (especially “all-channel” networks, in which every node is connected to every other node) more readily than can traditional, hierarchical, state actors. This means that conflicts may increasingly be waged by “networks,” perhaps more than by “hierarchies.” It also means that whoever masters the network form stands to gain the advantage. # 2001 December Zero comments multiorganizational networks . # 2001 December Zero comments Bruce Sterling . On siliconvalley.com, there is a nice mention of evolt.org‘s browser archive at browsers.evolt.org. # 2001 December One comment No hashtags. A petition to get Cold Fusion ported to MacOS X. Interesting, and not a bad idea. Cold Fusion is a fun web development platform, but also very capable. It’s newbie friendly. In that sense, it’s close to MacOS X in spirit — making great power accessible. # 2001 December Zero comments fun web development platform . Making massive changes on artlung.com to the home page. The blog has gotten too important to cram on the home page. and the home page is too bloated anyway. Given the size of this site, something must be done. It’s time for a change. In the meantime, what are those cheesy signs? Pardon our dust! I’ve been running Painter 3 since 1996. Never upgraded, didn’t use it much. However, through the magic of ebay I have obtained version 5 of the program (wahoo!) and now the program is stable (I used to crash after about 15 minutes of doing anything), and doesn’t look like a program designed for MacOS System 7 (lots of plain black and white interfaces). I’m pleased as punch. And to honor this – here’s a new header for the home page. I played with the natural media tools in Painter – calligraphy pens, water, airbrush, and so much more. The most current version may be 7 and be owned by Corel– but the leap from 3 to 5 makes me terribly happy. Why does software cost so much? And when did I become so cost conscious about software? I guess it’s also that I always viewed Painter as a frivolity. It’s not strictly necessary for me to have it to do web work, so why spend hundreds to keep it upgraded? I see software like games or “fun stuf” as an extravagance. And I suppose I see letting loose my artistic tendencies as an extravangance. # 2001 December One comment natural media tools web work . I blogged about an image whose subject was the airliner uprising on September 11th – and that I think it had emotional heft because that incident is something we don’t have pictures of. Looks like Neil Young has written a song about it called “Let’s Roll” — and I really want to listen to it. Anyone have a copy? I should check Neil Young sites — and I suppose it’s time to look at P2P clients again for when there’s stuff like this. # 2001 December Zero comments 9-11 comics music Neil Young politics terrorism . Yes, I remember the original Dark Knight Returns – I started reading it when I was in driving school. That was more than a decade ago. That comic changed my life, restored my appreciation for comics. These breathless fanboy reviews make me want to run out and get Dark Knight Strikes Back. I think the bias out there is still against taking the form of comics seriously as an artform. That’s a mistake. There’s some good work being done in the medium. It’s not all men in tights. This morning I put in a lackluster performance of racquetball. Once home, I napped for about 5 hours. Everything behind my nose feels like it’s filled with silly putty. Jenny rented several movies the other day, one of which was the new Planet of the Apes. It did not make me well. What the heck happened to Tim Burton. He did a nice job with Batman, and of course Pee Wee’s Big Adventure. And I’ve always been a fan of animation, so I remember seeing Frankenweenie for the first time vividly. So why the recent lameness in his work? Has he gotten soft? What happened to the brilliance he showed in Ed Wood? The larger question is this — why remake movies which had real vision? The original Planet of the Apes may be an old movie, but it was a solidly made one. Why re-envision it? Thinking of the movie business as not making any sense is not a particularly original idea, I suppose. # 2001 December Zero comments Tim Burton . # 2001 December Zero comments brief search page www.google.com/ie . # 2001 December Zero comments Baltimore Sun Department of Justice Florida James R.E. Smith Port Charlotte . I used to love making mix tapes. From USA Today, an article about the history of, and decline of cassettes. I suppose CD burners will take over, but cassettes are a pretty robust technology. CDs certainly have not proven as resilient as they were promised – they skip, they go bad. I guess none of the major music technologies are that great. What I’m waiting for is the ability to go down to the swap meet and buy everything that would be in the local Tower Records – on something the size of a single hard drive. In a Bruce Sterling novel people talk about having a copies of the Library of Congress — well, I want a copy of Tower Records! # 2001 December Zero comments Bruce Sterling Congress Library of Congress music technologies pretty robust technology USA Today . # 2001 December Zero comments Charles Platt . # 2001 December Zero comments Spice Girls . – You have two cows. – You sell one and buy a bull. – Your herd multiplies, and the economy grows. – You sell them and retire on the income. – You sell three of them to your publicly listed company, using letters of credit opened by your brother-in-law at the bank, then execute a debt/equity swap with an associated general offer so that you get all four cows back, with a tax exemption for five cows. The milk rights of the six cows are transferred via an intermediary to a Cayman Island company secretly owned by the majority shareholder who sells the rights to all seven cows back to your listed company. The Annual report says the company owns eight cows, with an option on one more. – No Balance Sheet provided with the release. # 2001 December Zero comments bank brother-in-law Cayman Island Dave Farber Enron . rudy turned me on to this dispatch from Craig Saila about how the events of September 11th have brought out an ugly side to some blogs. I myself stopped reading one or two blogs which were formerly filled with tastilicious nuggets of useful information, and have subsequently turned into piles of steaming vitriol. I still check back, but all I find there is spin, spin, spin. Hell, If I want spin I’ll turn on TV news or any of hundreds of radio shows. # 2001 December Zero comments Craig Saila . A native version of the AOL client for Mac OS X has been released. I also notice on that page that there are different installers for Windows XP vs. Windows 2000. That’s sort of interesting. Anyway, installed the new AOL client on the iBook here which has OSX on it. Why, you ask? Jenny uses AOL as her primary email, I use it as a tertiary email. Seems no different from the OS8/9 version, but it’s slightly smoother as far as UI goes. # 2001 December Zero comments AOL . Incidentally – still coughing – nose running – miserable sick. Could be worse, but could be much better too. # 2001 December Zero comments google Jakob Nielsen . Shirley E. Kaiser of SKDesigns has an great online column / blog called Brainstorms & Raves on all things web and design — and hey, it’s got great tips and links – check this link about the doubling of the use of Opera. Nice nice nice. And aw shucks, her site links to me! # 2001 December Zero comments online column Shirley E. Kaiser . Sometimes, even when you’re sick, you have to enter a viridian design contest. In this one, we rethink the Enron corporate logo. # 2001 December Zero comments Enron . Got this at work via Ingrid – who should start keeping a journal! # 2001 December Zero comments Ingrid . Do I have the the earliest mention of the Web Standards Project on usenet? I ask only because the Google usenet archive is current news right now. And another piece of current news is that the Web Standards Project is going on hiatus. I think WSP pushed for good things from Netscape and Microsoft. I had a part in writing the mission statement. I’ve had that early email of the alpha version of the mission statement on my site for a while. It evolved with the work of many more articulate than I into a fine mission statement. I wish that the [stds] mailing list archive were online. I’d like to be able to see those first discussions again — that vital energy was infectious, and empowering. We felt like we could take on the world! Or at least change the software development directions of two multimillion dollar companies. In the end, I don’t know how much effect WSP had. But it remains as it has been in my Fellow Founding Member biography: I am “proud to be involved, even cursorily, with something as worthwhile as the WaSP. # 2001 December Zero comments energy google microsoft software development directions Web Standards Project . New Words: I am a Frank Zappa Fan. I got this cool little FZ icon from rudy, and I had to use it somewhere. # 2001 December Zero comments Frank Zappa . # 2001 December Zero comments ASCII . Charles points to an article where asking for stamps without flags gets people questioned by the police. Characterizing this response to a postal transaction as “overreacting” seems like an understatement. Are terrorists loudly proclaiming themselves by showing anti-Americanism? Isn’t the very fact that the terrorists remained undetected an indication that they don’t call attention to themselves? # 2001 December Zero comments Dwight Yoakam Frank Zappa Santa Monica The Beach Boys Tom Waits United States . I got a really interesting email, well, a FWD from a dear friend – stating that the 12 Days of Christmas song lyrics are actually secret code designed to help kids remember the tenets of Christianity. As with all forwarded material whose content is really interesting, I wondered if it were so. Could it be true? After some research, I found a thorough examination of the claim: Urban Legends Reference Pages: Christmas (The Twelve Days of Christmas). Judge for yourself. Warning: There’s a MIDI file on that page. # 2001 December Zero comments christmas MIDI . # 2001 December One comment Taliban . i found the exact code i needed from one of your examples, thanks!!!! my deadline is still intact. didn’t leave an email address or last name, but I don’t mind. It’s nice to get positive feedback. I bought a lovely Christmas Tree on the way home from work today. I’ve prowled the streets in the past week, looking for trees at several places around town. Drugstores with trees out front, grocery stores with a few possibles – but precious few Christmas Tree Lots. At Mission Valley Mall they have a mega-plex of trees and poinsettias and wreaths — great selection — huge prices. But the hunt paid off today – picked up a nice specimen for 32 bucks. Even got to tie it to the top of my old Corolla. Had he been there, my Grandfather would have been proud: the tree didn’t budge on the 5 mile drive home. Add to that, Jenny likes it, so I’ll count the mission as a success. Thank you, and good night. # 2001 December One comment Mission Valley Mall . Dylan Foley has thorough considerations of the Web Standards Project and the recent activity on that site. He apologizes to me for stating that of the members of the WSP nobody had mentioned the recent events. No harm no foul Dylan. As far as anyone on that list having anything to do with WSP decisions, I’ve no idea. Jeff Zeldman appears to be going it alone. That’s his perogative as the current Group Leader. I do have one correction though — Dylan states “since it’s inception, he has been the public face of the WaSP and it’s Group Leader” — which is incorrect. George Olsen did the heavy lifting as the Leader who got WSP off the ground those years ago. There have been some mishaps for WebStandards.org over the years – the initial signup-for-support database was lost if I remember correctly – and various discussion lists which were once vital are nowhere to be found on the site. I think that there’s still a role for an advocacy organization to champion Jane Q. Developer. Luckily, WSP is only hibernating — it’s not dead. # 2001 December Zero comments Dylan Foley George Olsen Jeff Zeldman Web Standards Project WSP . Canada has put its house in order. It’s time to ask the U.S. hard questions about how Sept. 11 was allowed to happen is a difficult article from Lawrence Martin of Canada’s Globe and Mail. It contains fair questions about why some CIA and FBI asses haven’t been fired with regards to the glaring intelligence failures of September 11th. # 2001 December Zero comments Canada Central Intelligence Agency Federal Bureau of Investigation Globe and Mail Lawrence Martin Pearl Harbor Privy Council United States Wesley Wark . View From The Heart is an impressive blog. The fellow behind it is a veteran critical care nurse. I used to work closely with folks just like this. Savvy, articulate, and experienced. He’s just the kind of nurse it was a pleasure to work with. He’s been blogging for a long time now – and a google search finds references to “Respiratory Therapists” , “RTs” and “Respiratory Terrorists.” Which used to be a kind of compliment. RT-ing is a bit of a cowboy profession. I know I always felt like a gunslinger with my oxygen wrench, connectors and adaptors of various kinds, nasal cannulae, ET tube tape, screwdrivers, what have you. I know I was always ready for a crisis working 7p-7a nights. Anything can happen on the night shift, and it usually did. These two stories in particular moved me. I’ll be checking vfth.com again. # 2001 December One comment google search finds pence . From O’ReillyNet: A Primer for Accessible Web Pages. Quasi-related news item: Kynn’s still looking for work. In case you came here looking for a reference to netflix based on this, well, I like looking at peoples’ robots.txt files. I suppose my behavior is an amplified version of a a monkey with a twig poking at anthills. Yo! about this … check it! Dori Smith has my back! Check out dis and dat to see how when it’s right, she breaks with the artlung shout outs! (No, I don’t know why this post sounds like I’m a rapper. It is Friday though). # 2001 December Zero comments Dori Smith thanks . Regardless of what happens in our lives, we all must keep on moving. # 2001 December Zero comments Douglas E. Welch . Mr. Lester with a flash of funny genius on blogs. # 2001 December Zero comments Lester . It appears to be down at the moment. Google it and grab a mirror today! XIcons from MacNN – Icons like crazy! # 2001 December Zero comments apache google PHP unix Web Geeks X Server . I picked up the first of three of the Dark Knight Strikes Again last week. It’s got a helluva start and warranted me running out. I’m eagerly anticipating #2 and #3, scheduled to come out the weeks of January 16th and February 27th of 2002. I picked it up at The Comic Gallery. The clerk asked me if I had read it yet – presumably some folks are buying second copies – a reading copy and a save copy. I told him no, and he told me it was powerful stuff. I further told him that I had picked up the original Dark Knight at this very store, when I was taking Driver’s Ed classes across the street. He had been a clerk there even then, though I don’t recall if I bought it from him originally. He was a bit floored and muttered something about feeling old. I replied that well, how old does that make me?!?! It’s a very odd feeling to return after 15 years to buy the sequel to a comic book. # 2001 December 2 comments comics dark-knight memories the-comic-gallery-san-diego . Whoa. Great Christmas Eve at my Grandparent’s tonight. Some great gifts, including theatre tickets to see Mark Twain Tonight with Hal Holbrook. And to top it off, a new header featuring the great tree I got and which my lovely wife decorated. Happy Holidays! # 2001 December One comment Christmas Eve Hal Holbrook headers holidays Mark Twain Tonight . # 2001 December Zero comments Christina . # 2001 December Zero comments linux . In the end, those kids at Columbine committed suicide. And maybe the question should not just be, Why did those kids want to kill everybody else? The question should be, Why did they want to die? Those were some pretty unhappy kids. But you’re not allowed to be unhappy in high school. If you’re not with the program, they send you to therapy, they medicate you out of it. They don’t leave you any room to just be a surly teenager. I am thankful as hell that I was allowed to be a surly, quasi-happy teen. I was a mess, but I was never forced to put on a happy face. I was always told that life is hard. It’s normal and usual to have a stressful time as a human being. It’s reassuring in a way that you can depend on life being hard. Another Planet: A Year in the Life of a Suburban High School looks worth a read. # 2001 December Zero comments Elinor Burkett Great Elinor Burkett Suburban High School . I want it on the record that I won the soundtrack to the Royal Tenenbaums‘s being referenced here. I won for shouting “Dignan” in response to the cheesy DJ’s trivia question. Dignan is the funnest character from Bottle Rocket. Jenny and I are on a good streak this month. Jenny won the tickets to the sneak-preview screening. Let’s hope the trend continues! Played Cutthroat with two of my aunts tonight. Cutthroat = Racquetball with 3 players. Heckuva workout. I am definitely getting in better shape. Granted, I’m not in good shape yet. But I am in better shape. My shape has been a difficult issue my whole life. I’m overweight. Ideally I can integrate behaviors into my life which help the issue in a painless manner. If you’re a geek, you know very well how distinctive O’Reilly‘s book covers are. Now you can customize one for yourself! Hours of fun for the whole geek family. I have added a colophon to the site. # 2001 December Zero comments unix . More reorganizations taking place. I’m moving the mountains of content I have around into more logical places. One thing that’s being established is a words area, for pieces which are not journal items, not portfolio items, and stand on their own in some way. I’m exhuming some old mailing list posts for this area. I’ve been a very busy person on mailing lists since 1997 or so, and it’s about time I start to see if some of it needs a web home. First up: What is a Web Integrator?, from 1998. I also moved the WebStandards.org Alpha Baseline Proposal to prominence. In other “moving the deck chairs” news, I’ve moved my old sig files. Under the hood, I’m unifying navigation and site programming everywhere I can. According to automated checks with linklint I’ve done I have roughly 700 files and 3500 links on artlung.com. I’ve made it a goal to make managing the site as simple and painless as possible for me. Additionally, I want the site to be friendly to visit for web crawlers, visitors, family, friends, and avoid linkrot. # 2001 December Zero comments web crawlers web home Web Integrator . # 2001 December Zero comments American Society of Safety Engineers Clay Shirky George Herriman Jakob Nielsen Philip Greenspun Scott McCloud Seth Godin Steve McConnell Tom DeMarco . # 2001 December Zero comments html . I added a Netscape 6 Sidebar to the blog. So if you’re using Netscape 6 You have faster access to the list’o’links on the blog. The Netscape page on My Sidebar Developer’s Guide makes it seem much more complex than it is. At the heart of it all you need to call is a Netscape 6 only function called window.sidebar.addPanel() which takes three string parameters, the first is the name of the page, the second is a URL, and the third is to provide users with a page to customize the tab itself. I’m not using that, so it’s blank. Thanks to mathowie over on the 405 now I have similar functionality for Windows Internet Explorer users. Since the ArtLungSidebar is mostly for me, that makes me happy! The code is simple: _search=open('http://www.example.dom/sidebar.html','_search') where the first parameter is the URL of whatever you want to cram into the MSIE search pane. I wrapped it in a function for simplicity. Read more about the _search target. Nifty. # 2001 December Zero comments Internet Explorer users search pane _search target . Goliath is a neat free webdav client for Macintosh. webdav is neat. I don’t like Year-In-Review / Top 10 of 2001 / A Look Back at 2001 pieces in any media. Why aren’t there pieces on “the last 7 years in music” or “15 years in journalism.” Longer time spans would help us learn more about larger trends. We might even gain a better sense of time. If we’re looking back 12 months, how will we, particularly the young, get a sense of the past? I’d be happy with “the last 3 recessions in American history” or “150 years of the history of Afghanistan” or even “the use of electronics in pop music since the 60’s.” I f I want a high-level view of the past year, I can look at 12 months of magazine covers. However, I would prefer to learn something about history. But then, few have a gift for putting events and time into perspective. Perhaps the reason we don’t see more of what I want is because few can actually do the kind of research and thinking to put them together. Maybe I need to watch C-SPAN more. Booknotes, for example. often has smart people with something to say about history. And why? Because ideally, authors spend time and energy to compile lots of information, and sift through all of it to get a sense of what happened. I’d like more news outlets to act like historians. If they did, perhaps we’d all be better prepared for unexpected events. # 2001 December Zero comments Afghanistan electronics energy . Police in Pusan and the city’s education office asked elementary schools there to stop students singing the song and educate them as to why the terrorist must not be admired. from The Straits Times out of Singapore. # 2001 December Zero comments Pusan Singapore . The SDBA, the San Diego Booksellers Association, has a website and guide to bookshops here in San Diego. Cool. # 2001 December Zero comments San Diego Booksellers Association san-diego . Related to Christmas Trees, I’m retiring The Christmas Tree that was a header — and we now have a New Year’s Message. It is always enjoyable to exercise my lettering muscles. At one point I was quite passionate about lettering and typography. What was once a major is now a minor. Avid readers may remember my happiness at upgrading painter. This new New Year’s Header was made with that and my hand. I also did some futzing with drawing as well. Didn’t save anything though. Maybe next header I’ll do even more with the brush. I enjoy making these ornamental graphics. They’re useless but fun. Coincidentally, today I got a hit on artlung.com from an altavista search for “be a cartoonist” (in quotes). Apparently I’m the #1 hit for that search. This goes to show how out of touch altavista is, I think. I have no particular advice for would-be cartoonists. Better to ask Mark Martin or even Scott Adams. I think that the search hit is a result of the exact phrase “be a cartoonist” in a blog entry from August. At the time, the blog lived on the home page, and that’s what altavista indexed. 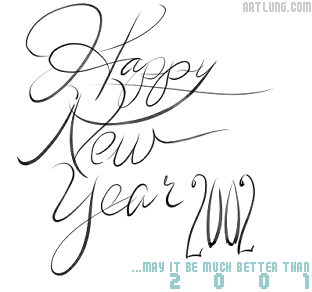 # 2001 December Zero comments altavista search art drawings headers Mark Martin New Year's Day Scott Adams .